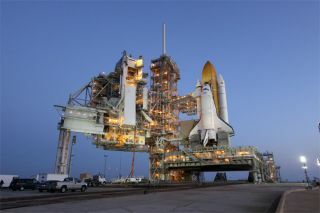 The clock is ticking down toward NASA?s planned Mondaymorning blastoff of the space shuttle Discovery. The countdown began early Friday as engineers primedDiscovery to launch before sunrise on April 5 at 6:21 a.m. EDT (1021 GMT) froma seaside pad at NASA?s Kennedy Space Center in Cape Canaveral, Fla.
"We're eager to get Discoveryflying on Monday morning,? NASA test director Steve Payne told reporters ina morning briefing. Payne said Discovery has two chances to launch next weekbefore NASA would stand down for three days to top off the vehicle's propellant tanks andavoid a space traffic jam later in April ? when an unmanned Air Force rocket isslated to launch very close to the shuttle?s planned landing day. Kathy Winters, NASA?s shuttle weather officer, has saidDiscovery has an 80 percent chance of clear skies for Monday?s shuttle launch,with similar conditions expected on Tuesday. It is the last shuttle flightcurrently scheduled to lift off in darkness [howto spot the shuttle launch]. Discovery is poised to launch seven astronauts on a13-day mission to the International Space Station on what is one of NASA?s lastfew remaining shuttle missions before the orbiter fleet is retired later thisyear. Shuttle commander Alan Poindexter commands the four-man,three-woman crew. The astronauts are hauling a nearly 27,000-pound (12,246 -kg)cargo pod packed with scientific experiments, supplies and spare parts for thespace station. Three spacewalks are planned to replace an old station gyroscopeand deliver a spare ammonia coolant tank ? pieces so big they can only bedelivered on NASA?s space shuttles. Joe Delai, payload manager for Discovery?s spaceflight,said engineers are hard at work loading the shuttle?s middeck with cargo. The shuttle is also being packed with a few last minuteitems, including extra seals for the space station?s water filtration systemand a spare bracket for a shock absorber used on one of the outpost?s treadmills,Delai said. Discovery is slated to launch one day after a RussianSoyuz spacecraft arrives at the space station. That Soyuz TMA-18 spacecraftblasted off this morning carrying one American astronaut and two Russian cosmonauts. The Soyuz?s arrival at the space station will boost theoutpost?s population back up to its full six-person crew for the first timesince last fall. When Discovery arrives on April 7, that number of peopleonboard will double yet again ? to 13 astronauts in all. NASA plans to fly four final shuttlemissions this year, including Discovery?s upcoming flight, before retiringthe shuttle fleet in the fall. After that, the space agency will rely onRussian spacecraft to ferry astronauts to and from the space station, as wellas support the development of commercial spacecraft in the United States forindependent access to space, agency officials have said.